life in the church, Women's Institute, golf, etc. She wishes the grandchildren were closer. Harry, at age 85, still enjoys good health, golf, his yard and sports on TV. He is still a Lion's Club member, being a charter member since 1957. 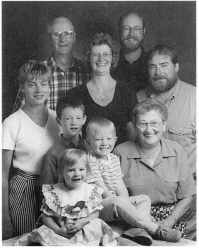 In 1998, the family marked their 50th Anniversary with an open house in conjunction with the Paulsen Family Reunion. Gene (born January 31, 1952) began working for Guardian Insurance in Edmonton, then moved to Vancouver, Calgary, Toronto and Halifax when the company was purchased by a Swiss Company. He is now employed by the Royal Insurance Company in Halifax. He married Susanne Lassen on July 3 I, 1992 in M ississauga. They have three children: Kurt born August 17, 1988; Kristian born February 7, 1993; and Kutlin born December 19, 1994. They are very sports minded children and enjoy hockey, baseball, soccer, swimming and music. Daidre Anne was born January 31, 1957 in Erickson, MB. She graduated in June 1975 and continued her educa­ tion in Winnipeg at Red River Community College. She received a diploma in Business Administration in June 1977. In August 1977, she moved to Edmonton and started a career in the Insurance Industry. 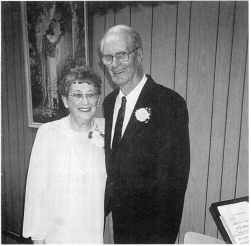 On August 16, 1986 she married Glen Barry Glasgow in Edmonton, where they still reside. Glen is a Refrigeration Mechanic at the University Hospital and Daidre is working for an Insurance Broker. After Dad passed away in 1983, Mom continued living in Brandon and spending some time at Ditch Lake. 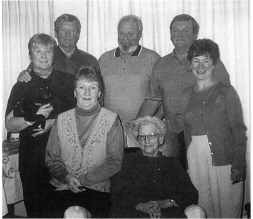 In September 1991, she celebrated her 80th birthday with family and friends in Brandon and Winnipeg. At the age of 88, she is involved in her church and continues to live on her own in her Brandon apartment.